According to new research data, published in Cellular and Molecular Gastroenterology and Hepatology, intra-abdominal fat cells may play a role in the pathophysiology of inflammatory bowel disease. Dr. David Bruining, M.D., explains the study. Fat accumulation surrounding the inflamed intestine, (also known as 'creeping fat' or mesenteric fat), during Crohn’s disease represents a hallmark of the disease. In this study, researchers looked at mesenteric fat in terms of its response to a neurotransmitter, known as Substance P, and observed that the fat cells were likely to elicit more inflammation. 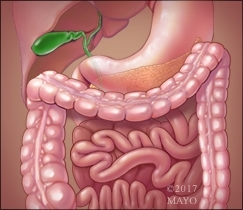 Researchers also noticed striking differences between inflammatory mediators in fat cells between healthy people when compared to people with Crohn's disease and ulcerative colitis, demonstrating that 'creeping fat' cells may play a role in ulcerative colitis. These findings could mean that targeting 'creeping fa't may be a future focus of treatment for patients with inflammatory bowel disease. Dr. Bruining is a gastroenterologist at Mayo Clinic.